Seif Eldin Mustafa as he poses with Ben Innes. 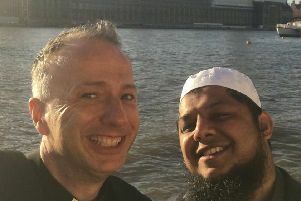 This is the moment when a Leeds man found himself posing for a photograph with a would be suicide-bomber who hijacked a plane. Ben Innes, 26, was on the flight with Seif Eldin Mustafa, who forced the plane heading for Cairo to travel to Cyprus while wearing what is now known to be a fake suicide vest. Mr Innes bravely had his picture taken with the hijacker of the EgyptAir Plane. A while later, Mr Innes was seen running on the tarmac with his hands in the air after leaving the plane along with the remaining passengers on the hijacked EgyptAir Airbus A-320, as the hijacker surrendered to security forces after a six-hour standoff at Larnaca airport’s largely disused old terminal. The photo has gone viral and Mr Innes has become the focus of worldwide attention. Speaking from her home in Biggin, near Selby, of her son’s ordeal, Mr Innes’ mum said she is just keen to get him back home. Pauline Innes said: “We don’t really want to comment on what has happened until he’s home and we know he’s safe and well. She added: “All we can say is that the picture is clearly not a selfie as everyone has been describing it. “You can clearly see that it is not Ben who is taking the picture. He’s in it but he’s not taking it. Four British nationals were on the Egyptian plane forced to divert to Cyprus. The captain and crew have been congratulated for how they dealt with the incident in which Mustafa claimed to have an explosive belt and took people hostage. The plane was carrying 56 passengers, including 26 foreigners, on an EgyptAir domestic flight from Alexandria to Cairo. Most of those on board were freed shortly after the plane landed at Larnaca airport on the Mediterranean island at 8.50am, before the hijacker held seven people hostage for a number of hours. A Foreign Office spokeswoman said: “We are relieved that the situation at Larnaca airport has now come to a safe conclusion. We are providing consular support to four British nationals caught up in today’s events. Diplomats in Dublin said they did not believe any Irish citizens had been caught up in the hijacking. EgyptAir said Cypriot authorities at the airport had confirmed “the explosive belt that the hijacker allegedly said that he was wearing is fake”. The Egyptian Minister of Tourism, Yehia Rashed, said: “We congratulate the EgyptAir captain and his crew for landing the plane safely and for putting the safety of the passengers as a priority, in a highly professional manner and in accordance with international aviation standards. “The Egyptian Prime Minister, Sherif Ismail, was personally involved in helping to resolve this incident and EgyptAir is currently taking the necessary steps to bring back all passengers involved. Footage posted on the official Facebook page of Egypt’s Ministry of Interior appears to show the hijacker passing through security before boarding the flight. Cypriot officials confirmed the incident had reached a peaceful conclusion. Officials said early on that the hijacking was not an act of terrorism, and later that the man appeared to be psychologically unstable. The man was said to have initially asked to speak with his Cypriot ex-wife, who police brought to the airport. At one point he demanded the release of women held in Egyptian prisons, but he then dropped the demand and made others. Egypt’s official Middle East News Agency identified the hijacker as Seifedeen Mustafa, without providing further details. The hijacking will raise serious concerns over security at Egyptian airports, and one aviation expert claimed the incident was a return to “the security stone age”. David Learmount said it appeared the captain of the flight “didn’t have faith in the security systems” and felt he had to follow the hijacker’s demands, resulting in the “first major successful hijack since 9/11”. But he said the captain should have been confident that it was “impossible” for someone to have got through security with a suicide belt. The incident comes just five months after 224 people were killed when a Russian aircraft crashed over Egypt’s Sinai Peninsula minutes after it took off from the Red Sea resort of Sharm el-Sheikh. Russia later said an explosive device brought down the aircraft in October, and the extremist Islamic State group (IS) said it was responsible.